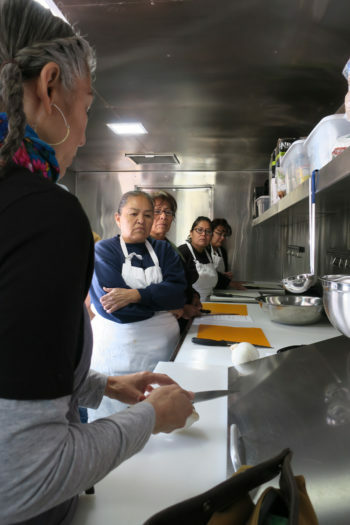 Through cooking classes, outreach, and social media, a new generation of Native Americans are reconnecting to Indigenous foodways. In the middle of the Arizona desert, within the 27,000-square-mile Navajo Nation, sits a half-acre garden oasis, bustling with fresh-grown veggies and flowers. Planted in 2016 as part of Coffee Pot Farms in partnership with the local Teesto Chapter, the garden now sprouts a plethora of greens as well as broccoli, peppers, tomatoes, and amaranth. The bushy rows of chilies, potatoes, corn, and garlic stand defiant in the dry desert landscape. At Coffee Pot Farms, master gardener Artie Yazzie and others host gardening classes and tastings in an effort to teach locals about the varieties of fruits and vegetables that grow in the desert and how they can use them in the kitchen. It’s a response to the lack of cooking skills within the Navajo Nation, a result of the hardships Navajo people have long faced, including forced assimilation and poverty. Collecting potatoes at Coffee Pot Farms in Dilkon, Arizona. Photo courtesy of Cherilyn Yazzie, co-owner of Coffee Pot Farms. 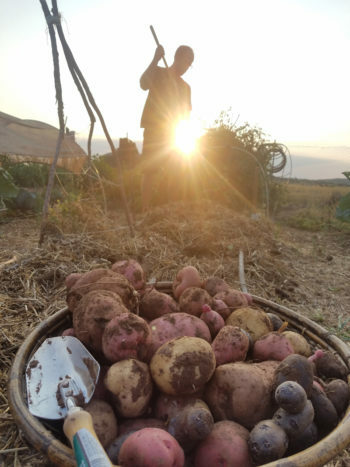 Native chefs and farmer all across the country have been working for years to take control of traditional and contemporary foodways in order to alleviate the ongoing problem of food insecurity in their communities. But growing food isn’t enough if people on the reservation don’t have the time or experience needed to prepare it. Ruiz is part of a multitude of Native-led attempts to address the health, nutrition, and access to healthy food in the Navajo Nation. 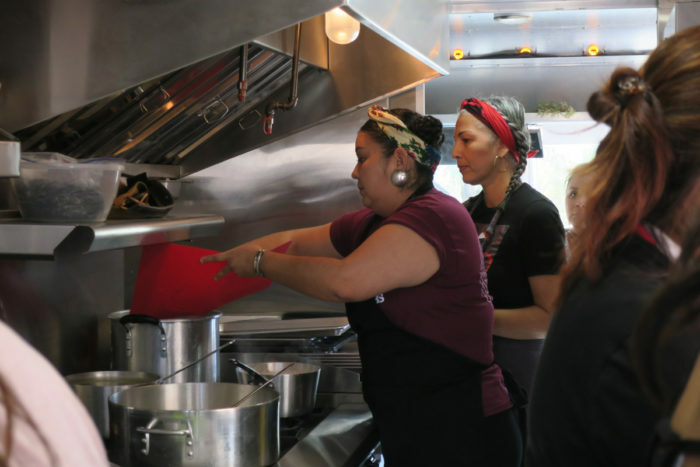 She leads cooking lessons in rural, Native Southwest communities out of a food truck known as “the mutton” or the Mobile Unit for Training and Nutrition (MUTN). In addition to the more traditional gardening-and-cooking programs, video bloggers and Instagram celebrities are spearheading digital-first efforts to bring Native foodways—including culture and traditions associated with indigenous foods—to Native people by way of their smartphones and tablets. Changes like these are urgently needed in the Navajo Nation—and many other poor Native communities. The Navajo Nation is the biggest and most populous reservation in the country, and is largely considered a food desert. There are just 10 grocery stores serving the 150,000 Navajo people living there—one grocery store for every 15,000 people. There are many more convenience stores that stock cheap foods high in calories and fat, such as shelf-stable pastries, chips, soda, bread, and sweets; and plenty of places to get fried, fatty foods like frybread and Spam-and-potato breakfast burritos. Chef Felicia Cocotzin Ruiz demonstrates how to properly hold a knife on the Mobil Unit for Training and Nutrition (MUTN). Photo courtesy of Felicia Cocotzin Ruiz. This lack of access to fresh, whole foods has predictable consequences: Native Americans have the highest rate of diabetes in the country, according to the Indian Health Services and National Health Interview Survey. To try to address these crises, funds from the Navajo “junk food tax” are distributed to 110 chapters on the reservation for health initiatives, nutrition classes, and community gardens. At the STAR School near Flagstaff, Navajo students learn about growing food and cooking as part of their curriculum. The Navajo involved in the Fruit and Vegetable Prescription Program are prescribed fresh produce as part of the Community Outreach and Patient Empowerment (COPE) program. And at the political level, a Diné Food Policy, currently under consideration by the Nation’s president and vice president, focuses on food sovereignty—or taking control of food in the Nation to promote health, economics, and self-sufficiency. 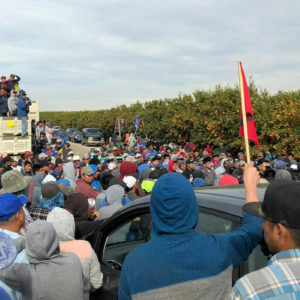 With a food policy in place, the Nation would have more control over the foods that make their way into grocery stores and make it easier for local farmers to sell their crops. 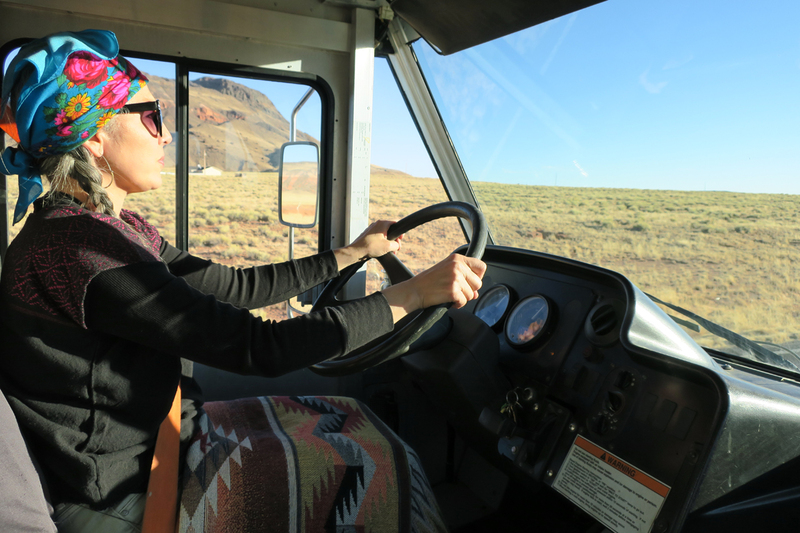 Not only is Ruiz part of this effort to eat healthier, she’s helping Navajo people reconnect with indigenous foods that grow in the desert—such as wild parsnips, cholla buds, wild spinach, and more. For some, eating these foods has been an eye-opening experience. 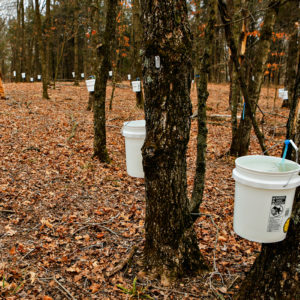 “So many people didn’t think about food access as [involving] the food available on the landscape,” Ruiz says. In her classes, Ruiz focuses on what the community already has, and doesn’t have. So in addition to using wild, native ingredients, she also incorporates ingredients that are affordable and available in Navajo grocery stores, such as broccoli and sweet potatoes. She says what she doesn’t do is come into a Native community and start teaching people how to make complicated sauces using expensive ingredients. In fact, Ruiz doesn’t even usually describe herself as a chef; she calls herself a cook when she’s out and about in the MUTN. On the Navajo Nation, lack of access to kitchen equipment and resources can also make cooking difficult. Appliances like food processors and mixers can cost hundreds of dollars, money that is simply not available to the 43 percent of Navajo people who live in poverty. Miss Tse’ii’ahi 2018-2019, Kaylee Mitchell, sports a new BlueBird Flour dress. Photo courtesy of Jerrica Mitchell. DIY signs advertising frybread, Navajo tacos, Navajo burgers, tortilla burgers, and Spam-and-potato breakfast burritos take up more space than street signs in small Navajo towns. On the reservation, these foods are a favorite. The 11,000 members of the “Navajo and Pueblo Cooking” Facebook group post a steady photostream of potatoes, tortillas, and frybread. And Bluebird Flour, a brand of bleached white flour sold in a white cotton sack, has become nearly symbolic of Navajo culture. The bluebird logo is made into aprons, earrings, entire two-piece dresses, and incorporated into all facets of contemporary Navajo culture. “Everything we eat today is processed food, and that’s what is killing us,” says Lena Guerito, nutritionist with the Navajo Nation Special Diabetes Project, a program that includes lessons on food nutrition for Navajos with diabetes. The main foods on a lot of Navajo people’s plates are potatoes and bread, she said. And that’s hard to change. The “survival foods” so common in the Navajo Nation were born in a time of need. In the late 1800s, the Navajo were forced by the U.S. government from their homelands in New Mexico, Arizona, and Utah to a prison camp in Fort Sumner, New Mexico. 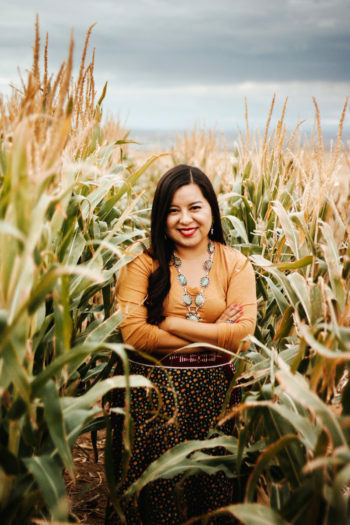 In her work as an advocate for food sovereignty—Livingston is the first woman to be elected as the Slow Food International Indigenous councilor of the Global North—she spearheaded the Navajo Nation’s junk food tax initiative. She also started focusing on where cooking habits are formed: mom’s cooking. “When we look back at what our moms cooked and what our grandmas cooked, I think we have the opportunity to question if [what we’re eating now] really is authentic mom’s cooking or if it’s survival food; and also question if we’re ready to change,” says Livingston. To her, changing the definition of mom’s cooking is part of the larger, Indigenous movement for food sovereignty. On a small scale, this work can take place at kitchen tables, where people teach their children to cook and value food, she says. Experiencing diverse flavors, ingredients, and restaurants also contributes to personal culinary education. But those things can be added to a long list of things many Navajo people don’t have access to, Livingston says. And that doesn’t mean the passion for food and adventure is not growing on the reservation. For Alana Yazzie (no relation to Artie Yazzie), culinary adventure meant leaving her parent’s kitchen and setting up one of her owne. While in college at Marquette University in Wisconsin, Yazzie broadened her food horizons: Not only did she try colorful, sugared cereals like Lucky Charms for the first time, she also learned about other cultures’ cuisines from her new Indonesian and Filipino friends. 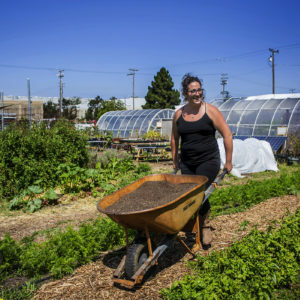 She found a love and appreciation for fresh vegetables, backyard gardening, and cooking. Today, Yazzie is a lifestyle and food blogger in Phoenix who goes by the online name, “The Fancy Navajo,” and has 5,700 followers on Instagram. She has posts recipes such as blue corn quiche, blue corn muffins and pumpkin pancakes, and Navajo boba almond milk tea. She didn’t always eat this way, though. Yazzie grew up on survival foods, including Hamburger Helper and other foods that came with powdered just-add-water sauces, she says. Her family made ends meet and, as a result, there wasn’t much extra money for eating out, so a lot of cooking happened in her house. From her mother, she learned how to cook dinner, and from her older brother, she learned how to bake. This summer, Yazzie harvested more kale than she needed from her backyard garden and ran out of ideas for how to use it. She asked her followers and fans on social media for suggestions and they responded with dozens of healthy recipes, she says. It surprised her, a little bit, to see so many suggestions coming from the reservation. This paradigm shift is about more than just shared knowledge, says Ruiz. Learning to feed yourself well is also about self worth. “People need to feel like they’re in power, which is hard from a colonized view. We’ve been taught that we’re not important,” she says. Chef Felicia Cocotzin Ruiz keeps an eye on progress on the Mobile Unit for Training and Nutrition. Photo courtesy of Felicia Cocotzin Ruiz. That’s why Ruiz has positioned herself in a role that allows her to speak to other Native people in a way that shows them she understands where they’re coming from. They’re not being talked at by an outsider who’s telling them to stop eating everything familiar to them. That, she notes, obviously hasn’t worked in the past. Instead, Ruiz believes that Native-led programs that meet people where they are and use a mix of traditional foodways and 21st-century tools can help chart a new course for food and health in Navajo Nation and beyond. I am in Winslow Arizona and would like to volunteer and support these efforts for sustainable , healthy food!! How can I help? 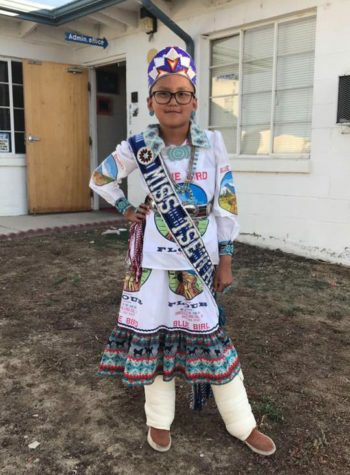 happy to see this article, my daughter lives on the reservation and has had to spend big bucks to get organic food. This is an excellent article. It is very encouraging to see what people are doing and the impact they are making. The Kañari people of the high Andes in southern Ecuador are involved in a similar effort. They have asked me to work with them as they build up their production and diversity of traditional crops. It alwsys makes us hopeful to find others working toward the same goals.